Hanging bracket for the Elite First Aid Series. Wall mountable box complete with a range of burns dressings for the treatment of minor burns and scalds. 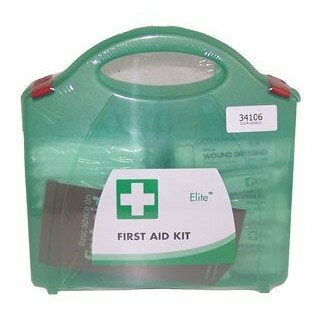 This Catering Kit has standard content plus useful addtional items. Ideal for Kitchens, Catering and Food Preparation Areas. Internal compartments for ease of access to the required dressing or treatment (except for Burns and Bio Hazard Kits). Secure lids to help protect contents against dust and moisture. Wall mountable - optional hanging bracket enabling the kits to be positioned at fixed first aid points but also easily released from the wall bracket to enable it to be carried to the injured person. Box measures 280mm X 280mm and contains the following items.